Born to the Italian nobility. Brilliant student. Studied medicine at Paris, France, and Padua, Italy, receiving his doctorates in medicine and philosophy by age 19. 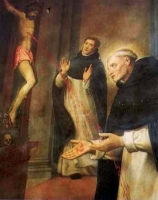 Practiced medicine for about a year, but following a vision of the Virgin Mary, he quit to join the Servites as a lay brother at Monte Senario in 1254. Ordained at Siena, Italy in 1258. Tried to hide his education so he could remain a simple member of the Order, but he was persuaded to use his gifts and background to further the Servite mission. Novice master at Siena in 1262. Sent to Forli, Italy to resolve a conflict between the papacy and the emperor, he was heckled and then physically attacked while preaching. Philip turned the other cheek. Father Philip's non-violent ways caused a converion in Peregrine Laziosi who later became a Servite saint. Superior of several Servite friaries. Elected prior-general of the order on 5 June 1267, much against his protests. Attended the Council of Lyons. Codified the Servite rules, and defended against attempts to disband it in the wake of the Second Council of Lyons which put restrictions on mendicant orders. Worked to bring peace to the Guelphs and Ghibellines in 1279. He was considered a candidate for the papacy at one point; when he heard the rumor, he went into hiding on Mount Tuniato until Pope Saint Gregory X was chosen. Worked with Blessed Andrew Dotti. Helped Saint Juliana of Cornillon found the Servite third order. Dispatched the first Servite missionaries to the East in 1284. Lived his last few months in retirement in a Servite house in Todi, Italy. Miracle worker and healer. He once met a leper on the road, and gave the man his cloak; the leprosy was instantly cured. Son of John and Anne Kemble. Studied at Douai, France. Ordained on 23 February 1625 at Douai College. Returned to England on 4 June 1625 as a missioner in Monmouthshire and Herefordshire. He tended to his covert flock for 53 years. Arrested at Pembridge Castle, the home of a family member, in 1678, and lodged in Hereford Gaol. Falsely accused of being part of the Titus Oates Plot. Condemned in March 1679 for the treason of Catholic priesthood. Martryed at age 80. Before leaving for his execution, John sat for a while with the under-sheriff, having a final drink and smoking a final pipe. This led to the Herefordshire expression "Kemble cup" and "Kemble pipe", meaning one taken before a parting. Joined the Dominicans at Spoleto, Italy at age 16 in 1236, choosing a life of extreme poverty even by Dominican standards. Founder and first prior of a Dominican friary in Mevania, Italy. Aided survivors and refugees in Mevania after it was sacked by emporer Frederick II in 1248. Helped quash the return of the Nicholaites anti-montanist heresy in Umbria, Italy. Reputed miracle worker. Born to a wealthy Catholic family. Studied in Douai, France and entered the Roman College on 5 November 1641, using the name John Marsh. Ordained 3 December 1645. 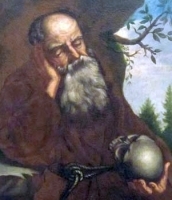 Joined the Friars Minor in Rome on 1 January 1651, taking the name Joachim of Saint Anne. Vicar and novice-master at Douai. Joined the Worcester mission in 1656 where he served for over 20 years, using several aliases, and living as a fugitive. Arrested in connection with the Titus Oates Plot in December 1678; acquitted of participation in the plot, but was martyred for the crime of priesthood. Born to the imperial Roman nobility, the son of Senator Faustus and Blessed Augusta. Covert Christian. As a young man he studied at Autun, Gaul (in modern France). There he was arrested by provincial governor Heraclius for not worshipping the pagan goddess Cybele, he asked for tools to destroy the statue. Arrested and flogged for heresy. Because he was from a noble family, he was given a chance to recant, and was even offered bribes to do so; he declined. Martyred in the presence of his mother. Born to the Irish nobility. Brother of Saint Bridget the Younger. Educated by Saint Donatus of Fiesoli, and made a pilgimage to Rome, Italy with him in 816. When Donatus was miraculously chosen bishop of Fiesole, Italy, Andrew was ordained as archdeacon. He served for 47 years, restored the church of Saint Martin and founded a monastery in Mensola, Italy where he may have lived for a while as a monk. He was known as "the Scot", common in that day when speaking of some one from Ireland. Legend says that as he lay dying, his sister was brought to him his bedside by an angel for a final farewell. Little is known of his life, which caused many later writers to fill in the details with pious fiction. Married to a widow name Creswell; both his step-sons from that marriage became Jesuits. He held a civil service position, possibly as coroner, until c.1565 when he began to be persecuted for his Catholicism. Imprisoned for a while at Hull. Widower. He travelled to the European continent in 1580, staying in Rheims and then Pont-a-Mousson in France, and then in Rome, Italy where he obtained dispensation to study for the priesthood. After ordination, he returned to England to minister to covert Catholics. Arrested in York Castle on 22 July 1582 for the crime of priesthood. Abused, loaded with chains, imprisoned underground, and repeatedly interrogated before being executed for being a priest. Martyr. Greek Catholic. Born to a farm family. Entered the seminary in 1913; his studies were interrupted by World War I, but he graduated in and was ordained in 1919. Taught moral theology at the seminary in Ivano-Franksivsk. Believed to have been secretly ordained a bishop in April 1945; the secrecy was necessitated by Soviet persecution of the Church. Arrested for his faith by Soviet secret police on 26 October 1949; held until 11 February 1955. Worked as a covert priest after his release. Imprisoned again in July 1962. Contracted tuberculosis and died in prison. Martyr. 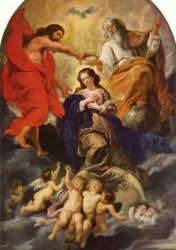 A Marian feast day decreed by Pope Pius XII in his encyclical Ad caeli reginam to recognize and celebrate the Blessed Virgin Mary as Queen of the world, of the angels, of heaven, etc. The movement to officially recognise the Queenship of Mary was initially promoted by several Catholic Mariological congresses in Lyon, France, Freiburg, Germany, and Einsiedeln, Switzerland. Pro Regalitate Mariae, an international society to promote the Queenship of Mary, was founded in Rome, Italy by noted Marioligist and writer Father Gabriel Roschini. Born to a peasant family and grew up poor but pious. Joined the Franciscan Friars Minor. Priest. 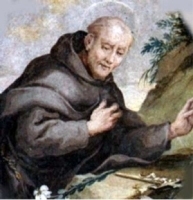 Franciscan novice master in Campli, Teramo, Italy, and lived in the San Angelo d'Ocre convent. Noted for his austere devotion to the Franciscan life, his deep prayer life, and devotion to Franciscan saints. Received visions of the Blessed Virgin Mary and Saint Francis of Assisi. Priest in the diocese of Verdun, France. Imprisoned on a ship in the harbor of Rochefort, France and left to die during the anti-Catholic persecutions of the French Revolution. One of the Martyrs of the Hulks of Rochefort. Studied at Douai, France; ordained in Rheims, France in 1579. Returned to England to minister to covert Catholics. Tutor for Richard Dymake's family in Scrivelsby. Arrested near Wakefield in 1582 for the treason of not accepting the Queen as head of the Church. Martyr. Benedictine monk. Spiritual student of Saint Benedict Biscop, and brother monk to Saint Esterwine of Wearmouth and Saint Ceolfrid. Biblical scholar. Co-adjutor abbot of Jarrow Abbey. Abbot in Wearmouth, England in 686. Priest in Antioch, Syria. He re-located to Rome, Italy where he became a noted preacher. Martyred in the persecutions of Diocletian. Wealthy third-century lay woman in Seleucia, Asia Minor. Convert to Christianity, baptized by Saint Athanasius of Tarsus. Driven out of Seleucia due to her faith, she lived as a desert hermitess for 23 years. Imperial government executioner in the reign of Commodus. Convert who had to immediately turn his back on all his previous life. Ninth-century hermit whose records have been lost but who has been long venerated in Arnulphsbury, Cambridgeshire, England. Bishop of Tarsus in Asia Minor. Martyred in the persecutions of Emperor Valerian. Priest. The only one of a group of 50 martyrs whose name has survived. Nun. Abbess of a convent in Northumbria, England. Martyr honoured in Ostia, Italy.